Just a quick post to show you the second of my Little Cotton Rabbits knitted elephants. Meet Bonnie – short for Bonita as she was completed in Spain which is why she is posing among the bougainvilleas at my house. 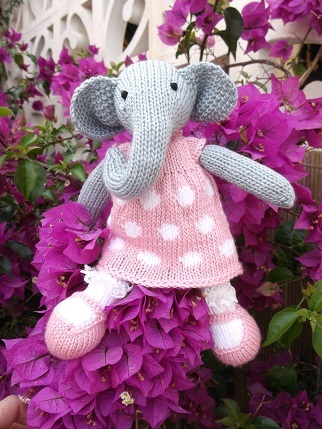 She has been sent to live with Becky, Ellie’s best friend from University, who loves elephants. Am now on with the third elephant – have done 9 bunnies so far – I love knitting these just as much as people like receiving them! I can’t sell them as I didn’t write the original pattern, Julie from the Little Cotton Rabbits blog is the very clever person that did, she makes animals for sale but there is an enormous demand for them, I tried for a few years to be lucky enough to buy one for my daughter but there were about 500 people wanting each batch of 30. That is partly why Julie released the patterns. Your best way of getting one is to find a knitting friend and get them to buy the patterns from Julie’s blog, they are brilliant value at about £5.00 per animal (girl rabbit, boy rabbit etc) and about £4.00 for the additional dresses and jumpers patterns. They are really easy to knit and the patterns are very well written with lots of pictures to help you. Then you can have as many as you want but warn your friend they are addictive!